The 2009 Greater Victoria Flower Count has broken a billion on the bloom scale with 1,067,011,747 blossoms. Victoria led the municipal pack at 399,887,613 and Saanich was second with 243,589,245. The total count and winning municipality was announced on March 23, 2009 by Bruce Carter, CEO of the Greater Victoria Chamber of Commerce. “While the rest of the country is still scraping their windows in the morning we have counted over one billion flower blossoms,” says Carter. “Joggers can be seen everywhere training for the TC 10k and fair weather golfers are heading out to play. 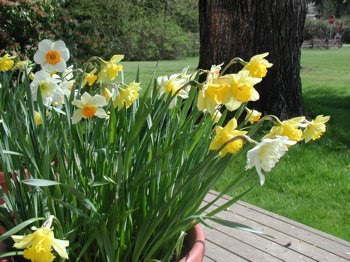 The daffodils are in bloom, it’s spring in Greater Victoria with the best climate in the country, and we’re open for business!" The Greater Victoria Flower Count is a lighthearted event to promote Victoria as an attractive shoulder-season holiday destination. Citizens across the municipality were invited to count their blossoms and enter their count on the flower count website. The count began March 18, 2009 and ended at noon on March 23. The 2009 Flower Count was organized by the Greater Victoria Chamber of Commerce, the WestShore Chamber, the Saanich Peninsula Chamber, Butchart Gardens and Tourism Victoria.